This post presents a Task Scheduler App for Mac OS X 10.6 to let you schedule tasks to be executed at a later date / time. Whether you wish to run Applications or Open Application Files at a Later Date / Time. With this Scheduler App for Mac, you can schedule a program to run one time in future or even schedule it to run at a specific time on multiple days. 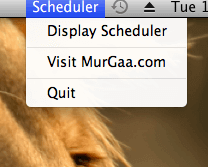 The Main Application window of this Mac Scheduler as displayed below can be minimized in status bar with a status menu. Mac Task Scheduler to Schedule Application or Files to run or open at a Later Date / Time. The above screenshot displays the main window of the Mac Scheduler App in which 3 different tasks have been scheduled. With this Mac Scheduler you can Schedule Applications or Files to be launched automatically at pre-configured date and time. Note that the right click menu of this Scheduler allows you to add, edit and delete scheduled tasks. Once you have added the appropriate files or applications with date / time, you can hide the main window of the Scheduler to the status bar. 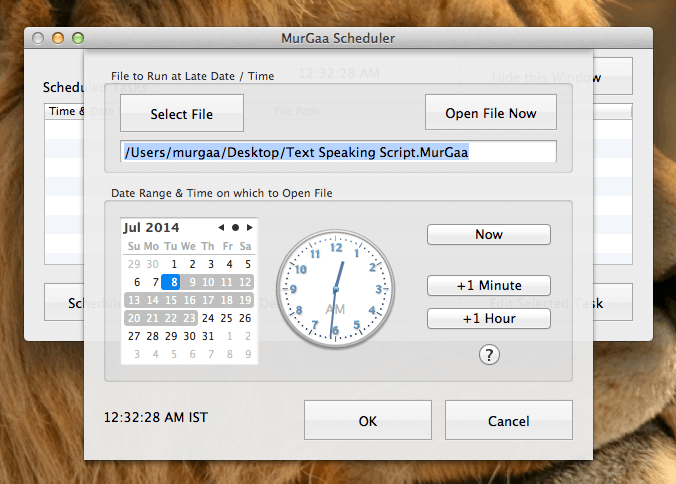 The above screenshot displays the new Task Window of this Scheduler App for Mac OS X. Note in the above screenshot that multiple dates have been selected with the help of shift key on the keyboard, also note that the time of task execution can be selected by moving the hour and minute hands of the analog clock in the new schedule task window. 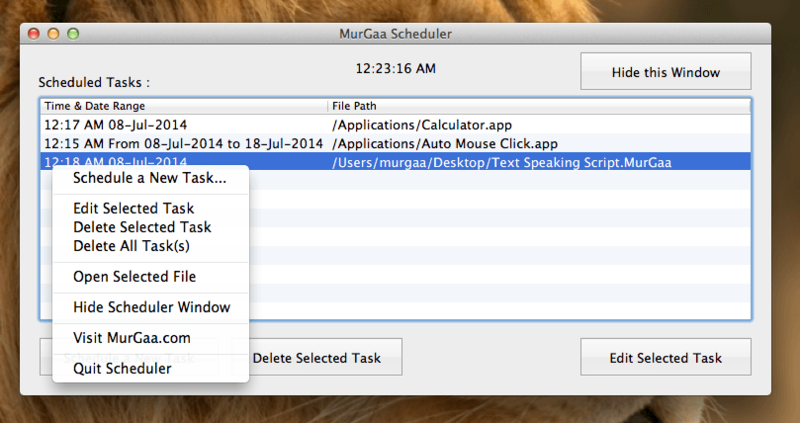 The New Schedule Task Window can also be used to edit any task already scheduled with this Mac Scheduler Application. Download and try out this Scheduler Application on your Mac running 10.6 or later versions including Snow Leopard (Mac OS X 10.6), Lion (Mac OS X 10.7), Mountain Lion (Mac OS X 10.8), Mavericks (Mac OS X 10.9) and even on your Mac running Yosemite (Mac OS X 10.10). Once the trial usages have been used, you can unlock the trial limitations of this Mac Scheduler by paying in nominal registration fees of $5.00 only. You can also watch a Video Tutorial of this Mac Scheduler App and learn how easy and quick is to schedule your daily or recurring tasks with this Mac Scheduler Application. This Task Scheduler Application for Mac Application is a really simple and easy to use OS X Scheduler Application. Yes your Mac needs to be powered on and in active state for this Scheduler to execute it’s scheduled tasks. Execution of the Scheduled tasks can be easily aborted by either quitting the application or by simply deleting the configured tasks. 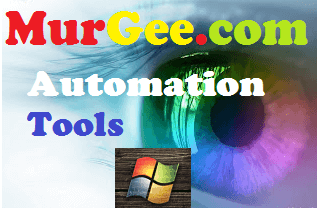 This Free trial has no functionality limitations apart from usage based limitation. All you need to schedule your applications is to download the Scheduler, run it and add the applications you wish to be scheduled.